“Let’s do some good!” Kevin Costner’s Eliot Ness crows at the start of a botched liquor raid in 1987’s The Untouchables, the triumphant collaboration of screenwriter David Mamet and director Brian De Palma, both doing the warmest, most accessible work of their careers. Terry Green’s earnest potboiler No God, No Master is set about a decade earlier than The Untouchables—circa 1919-21 instead of 1930—but it aspires to the richness and operatic scope of De Palma’s film, albeit on a much humbler budget, without Mamet’s pungent dialogue, and with good character actors instead of movie stars. In No God, No Master, cool hand David Strathairn plays Bureau of Investigation (the “Federal” came later) agent William Flynn, assigned to track down whoever is responsible for a mail-bomb campaign targeted at prominent American men of the era: Standard Oil tycoon John D. Rockefeller, Supreme Court Justice Oliver Wendell Holmes, and banker J.P. Morgan, Jr., among many others. Flynn’s inquiries would probably be more difficult if the explosive parcels weren’t all identically wrapped and addressed in the same handwriting, which seems like an awfully dumb, lazy way to conduct a terror plot—but hey, it was a more innocent time. Then again, considering that a whole roomful of the package bombs are intercepted because they were shipped with insufficient postage, it’s likely this criminal conspiracy wasn’t burdened by genius. Flynn begins investigating anarchist groups that recruit young immigrant men by giving voice to their anger about unfair labor practices. He crosses paths with one Carlo Tresca (Edoardo Ballerini, who looks like Gary Oldman back when he was a Gary young-man), a union organizer urging the same workers to protect their rights by nonviolent means. Flynn is a reasonable fellow, sympathetic to the workers’ grievances. In a meeting with Rockefeller Sr. (an imperious David Darlow), Flynn even dares to rebuke the old skinflint for paying his laborers in a currency only valid at his own stores. “I have no intention of allowing myself to be intimidated by a bunch of discontented immigrants,” Rockefeller huffs. Meanwhile, Attorney General Alexander Palmer (Ray Wise, most famous for playing a different Palmer, the father of Laura Palmer from Twin Peaks) is rounding up immigrants on flimsy evidence and deporting them as quickly as he can manage. (Green doesn’t overemphasize the point that this was hardly the last time the United States reneged on its commitment to protecting civil liberties.) Sean McNall leaves an oleaginous residue in his minor role as Palmer’s sniveling aide, an ambitious young Justice Department attorney named John Hoover—though he prefers “J. Edgar”—who busies himself drawing up lists of undesirables. 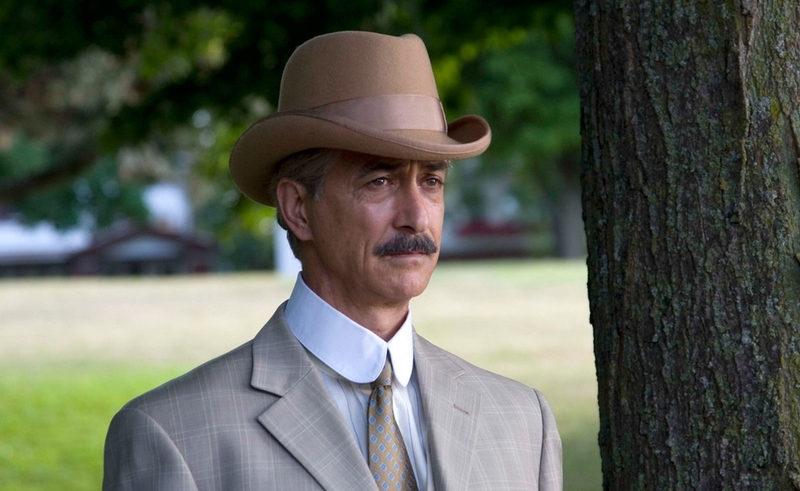 Strathairn is the only actor in No God whose work could be called subtle. He never plays Flynn—who in real life, went on to precede Hoover as the Bureau’s chief—as a zealot or a bully. He’s a principled cop who takes his job seriously, but he’s here to save lives, not protect the profits of the world’s Scrooge McDucks. Green’s script deviates from the detective plot to encompass the story of Bartolomeo Vanzetti and Nicola Sacco, Italian immigrants who were convicted of murdering two men during a 1920 robbery in Massachusetts, and executed seven years later. They maintained their innocence, and the film supports the widely held view that they were framed because of their involvement in the anarchist movement. Alessandro Mario makes an an irresistible Vanzetti. He triggers the violins in Nuno Malo’s swelling score every time he fixes his deep-set eyes on the horizon and whispers soulfully in Italian about how he is an honest man, like his father before him, and like all honest men he deserves an honest wage, and more than an honest wage, he deserves dignity, etc. He’s a one-topic kind of guy. But who isn’t, in a movie this overstuffed? Anarchist Emma Goldman (Mariann Mayberry) appears for a handful of blink-and-miss-them scenes, too, just long enough for her name to ring some distant bells for fans of composer Stephen Sondheim (she’s a character in Assassins) or historian Sarah Vowell (who gave Goldman some play in her great non-fiction book Assassination Vacation). There’s far more happening in the margins of this film than its compressed 94-minute runtime can fully support. With its staccato scenes, period costumes, and (with the exception of Flynn) flat characterization, No God, No Master sometimes feels like a musical from which all the songs have been cut. And while many scenes don’t get enough room to breathe, others are just ill-conceived. Flynn’s confession to his young, dumb partner (Sam Witwer) that he feels responsible for getting his prior partner killed is torn straight from the Big Little Book of Cop-Movie Clichés. When Flynn asks an immigration official for a list of persons denied entry to the U.S. in the last 60 days, not only does the guy have the document drawn up and sitting on his desk already—it’s one page long. Finally, there’s the deus ex machina climax where Flynn enjoys the only-in-the-movies pleasure of handing Palmer a bombshell of a letter from President Woodrow Wilson—a letter Palmer, his superior, somehow didn’t know about first. Wise’s reaction is worth the contrivance required to get there, but it didn’t have to be this contrived. So: It’s clunky, it’s hokey, it was clearly made on the cheap. It’s also ambitious in a way that more expensive films are rarely allowed to be anymore, illuminating a fascinating, underexplored era of American history, when the country had emerged from its long puberty as a global power, but struggled to live up to its own ideals. No God, No Master is plenty touchable, but it punches above its weight.